"The lady doth protest too much methinks." Stocks opened higher, but were a bit wobbly most of the day. They managed to rally back into the close, ending up largely unchanged from the close last Friday. The US Dollar was rallying from the overnight and hit a new high for the year. 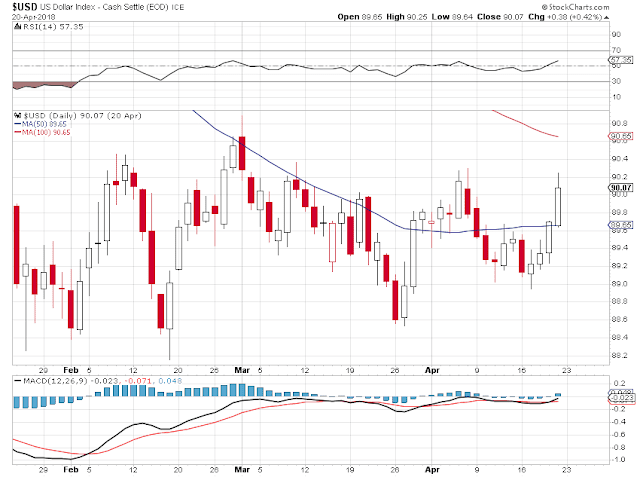 It is still within a longer term trading range however. Despite what Larry Kudlow might say about the benefits of a stronger 'King Dollar', an unusually strong currency acts like a tax or tariff on a nation's exports, and a subsidy on its imports. This is hardly what might support the grand plans for the renewal of American's economic growth. But it does favorite financiers for whom the dollar currency is an instrument of advantages. Gold sold off almost one percent. Silver fell a full three percent, giving back the gains from last week, losing the 17 handle in the process. There will be a Comex precious metals option expiration on this Wednesday, 25 April. The expiry seems to be more significant for silver than for gold. Perhaps this is one reason why silver was hammered so hard in particular today. CNN is smearing those who question the corporate media narratives as 'extremists,' lumping genuine progressives in with neo-nazis and pedophiles. Even the DNC did not go quite that far in their attacks on Bernie Sanders and the progressive grass roots of their own party in 2016. The slow winding of the credibility trap is going to lead the self-anointed into paranoia and retribution. How else can Hillary explain why she was denied her presidency? And how will Trumpolini explain the coming collapse in all his grand economic plans for revitalization? I get the odd feeling that the public will at least pick up the tab for all these grand delusions, and perhaps even end up being the whipping boy for the failure of the anointed.